The Legacy Chronicles: Spooooky Flower Friday! Since this Flower Friday is part of LLB Backyard's No Tricks, Just Treats for Shelters weekend, I thought we'd better make it an extra spoooooky one. So introducing our special guest stars! Ichabod, Elvira, and Raven are showing off our beeYOUtiful flowers in the front yard. We got all of them from LBR's big Mums & Roses fundraiser! Fossil is showing off his favorite mum. He loves the bright yellow to brighten up our dreary fall days, especially with all the RAIN we've been having! we love your yard... and how clever your mama arranged the pups! 8 paws and 2 wild wagging tails for a super howl-o-ween decoration! WOW, we just love those Mums!!!! OMD..What gorgeous Mums...and I bet you don't have to worry about Ichabod, Elvira and Raven munching on them either BOL! Your front yard looks fabulous! 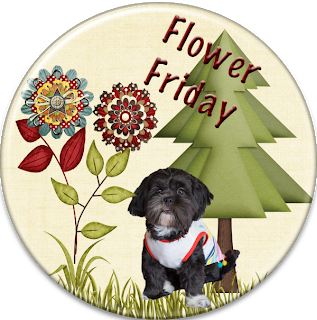 What great Howloween decorations and the flowers are beautiful! Very spoooooooooky!!!! I love your mums too! Your mums are beautiful and are a nice accent to your yard. If we lived close we would buy some mums from LBR. Think you need to feed your friends BOL!